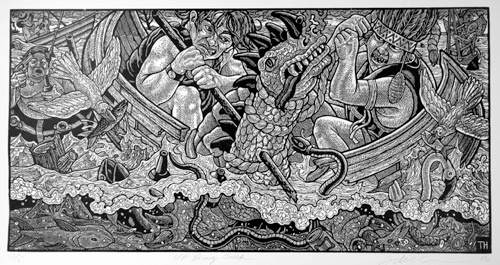 Some critics say Tom Huck is the greatest American artist working in woodblock today. While others might dispute that ranking, he is certainly among the handful of modern masters that includes Bill Fick, Endi Poscovic, and a few others, depending who you ask. 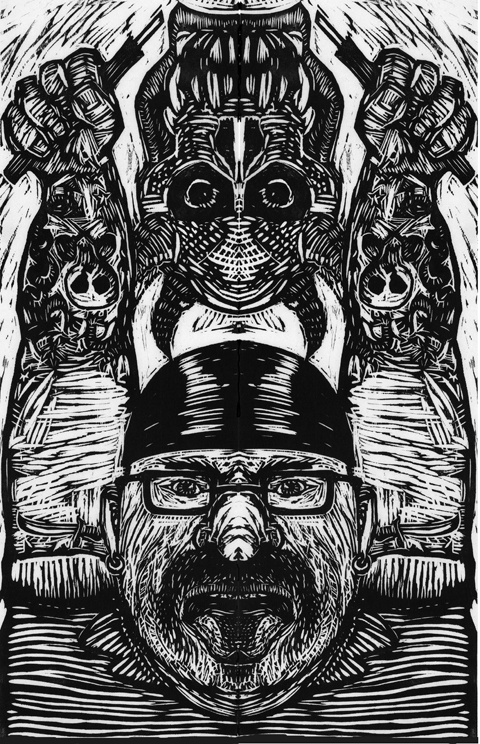 Huck runs Evil Prints, a state-of-the art print studio in a borderline neighborhood of St, Louis. Most university print programs would envy his work space and presses. Huck is surrounded by an entourage good-looking women, and bad-looking men. Printmakers are an odd lot. Huck is odder than most. He throws wild ‘performance’ parties. He is sponsored by Pabst Blue Ribbon. He tours Central Europe with the heavy metal rock band, Moterhead. Until last year, he somehow managed to juggle his wild side with another life as a faculty member at Sam Fox School of Art and Design, Washington University, St. Louis. Something happened. Something he said or did led W.U. to let Huck go. According to press reports he did not go gently in that good night. From what I can gather he hired a lawyer and negotiated a settlement. Let’s assume the settlement includes a non-disclosure agreement, since Huck will talk about anything other than his separation from W.U. This week, his old school, Washington U. is playing host to SGC, the biggest, most respected printmaking conference in the U.S. Huck was not invited to participate. He doesn’t take slights well. He decided to mount his own week-long alternative conference “Evil Week” at the same time, as a response to SGC. 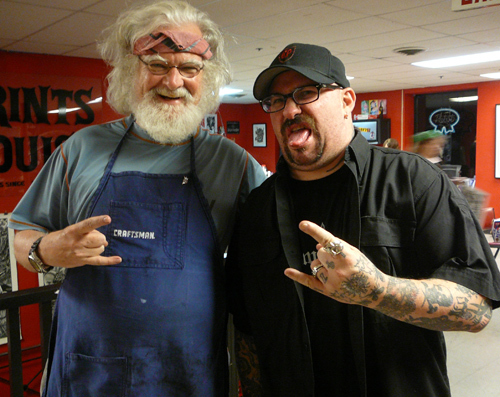 He has a one-man exhibition at the St. Louis University Museum of Art. He’s got a red bus to serve as a free ferry from the SGC conference to his big event, the Printbanger’s Ball. 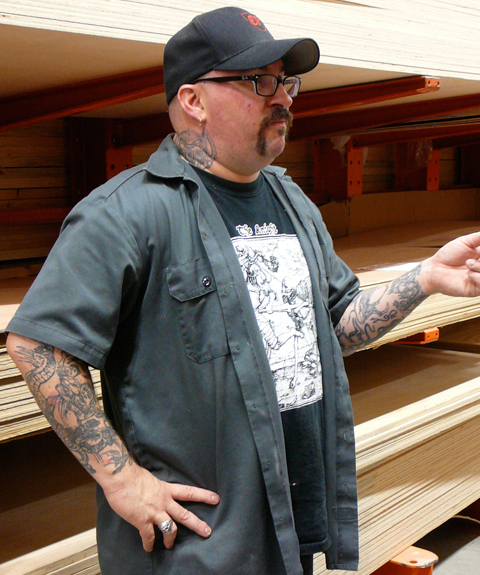 Huck says Home Depot has decent birch ply & superior hot dogs. 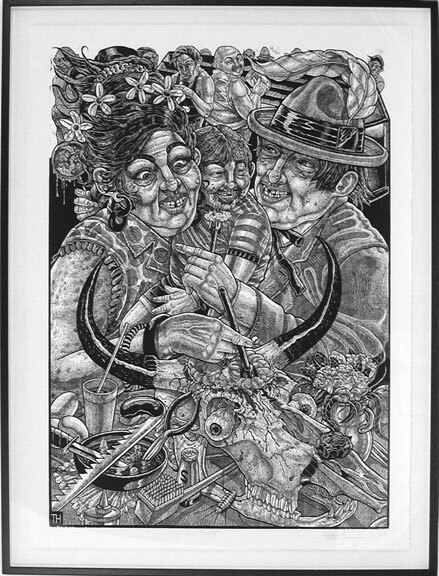 Artemio Rodriquez, a great Mexican printmaker is artist-in-residence at Evil Prints for the week. Of course, there will be a St Patrick’s day party on March 17. Looks like there will be one hell a Wolfbat War Vessel parade directed by Dennis McNett. There is Pub Crawl Scavenger Hunt, –order a Pabst at any of Huck’s favorite dives and you might snag a limited edition coaster with a print by Huck or guest artists including Bill Fick, Gary Panter, and Sean Starwars. Best place to read about the Evil Week events is EvilPrints.com. Also check out Printeresting, the most dependably readable printmaking blog for the scoop on Huck’s alternative activities. As a 2010 graduate of The Evil Prints Bootcamp I have been invited to join in this counter-conference. I’ll be there this weekend at the Printbanger’s Ball selling prints and a special zine created in honor of the occasion. Hope my print sales will cover my airfare. (Note to the Governor: No Kutztown University funds used for my trip.) Look for an update next weekend.